Imam Yayha Hendi is the Muslim chaplain at Georgetown University, the first American university to hire a full-time Muslim chaplain. As chaplain he leads Qiyamul-lail and Friday prayers, counsels students, and offers retreats for both Muslim and non-Muslim students. A consistent advocate for interfaith understanding, Hendi is the founder and president of Clergy Beyond Borders and Imams for Universe, Dignity, Human Rights and Dialogue. He has also written numerous publications ranging from women and gender relations in Islam to religion and Islam in the United States. 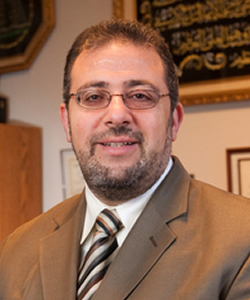 Hendi is also the imam of the Islamic Society of Frederick, the Muslim chaplain at the National Naval Medical Center, and the spokesperson of the Islamic Jurisprudence Council of North America. He holds a master's degree in Comparative Religions from Hartford Seminary and is currently working on his Ph.D. in Comparative Religion at Georgetown.